Participants from Virginia and West Virginia boarded planes for Bozeman Montana with high hopes and lots of anticipation. 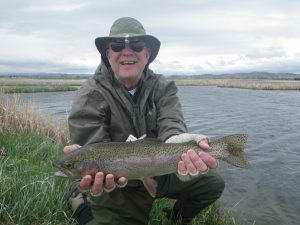 Trip Leader Bill Campbell had encouraged everyone to watch local weather web sites, read web sites about the location and the fishing, and make sure they were ready for big fish and a wonderful wilderness experience along the Smith River in central Montana. Once at the airport, the only disappointing news we’d hear the entire trip was the first thing we heard. Our Hostess Laura Geary picked us up at the airport and once she had everyone in a truck and headed for their Healing Waters Lodge she told us the rivers were so blown out we weren’t going to be able to fish or float the Smith. It was at record flood stage and would not come down for the duration of our trip. 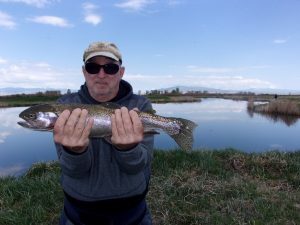 She assured us alternative plans were already in the works and we were told we’d spend our time there in Montana fishing smaller riv ers and private waters that would not disappoint us. That statement turned out to be true beyond anything we could imagine. For the next five days we caught rainbow, brown, and brook trout in sizes we were just not used to. Huge, beautiful fish. The accommodations were stupendous. Over the top is the easiest way to describe them. The rooms were comfortable, the view from all of them breathtaking, and the food was outstanding. The only thing that topped all of this was the way Mike, Laura, and their staff treated us when we came in from each day’s fishing. Their attention to detail and personal touch made this much more than a fishing trip. It was a luxury vacation with some tremendous fishing thrown in. As soon as we were settled, several of us tried fishing the pond on the property. Bill Leasure and Bill Campbell were the first to catch fish. 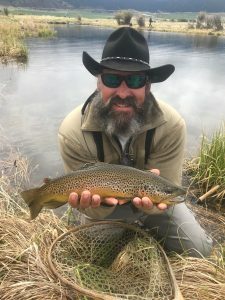 At dinner that evening, we sat with Mike and found that he’d planned a series of trips to smaller, local rivers and some private waters he had access to that would be very productive despite the weather conditions. Our first full day fishing was on Wheat’s Pond. The weather was cold, wet, and windy but we still caught fish. The second day we headed to Circle Three ranch where our guide’s promises proved true. Rainbows and Brown trout well in excess of twenty inches were caught by Isaac, Bill Leasure, and Kevin. The largest Brook trout caught that day neared sixteen inches, which is a wall hanger when compared to the small creek, mountain Brookies we’re used to seeing in Virginia and West Virginia. 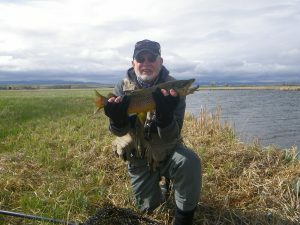 On our second day on the water we were split into smaller groups to go to the Madison River and other private waters. The catching continued as our guides did their job well and put us on fish everywhere they took us. The weather was improving and when the crowd cover would cooperate the fish would turn on. 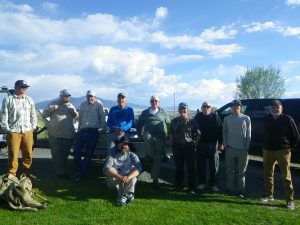 Bill Campbell had a difficult time on the Beaverhead River until he reached a spot where he pointed to a particular spot against the bank and told his guide Terry “there’s a fish right there”. With an accurate cast right to the spot he proved his point and pulled out a nice sized Brook trout. 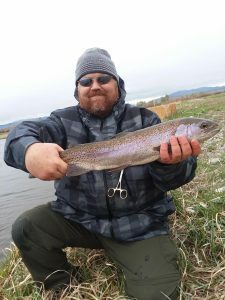 Over the next several days we fished the Big Hole River, Circle Nine ranch, and a few other spots. During our drives to the river we found out why Montana is called Big Sky Country with breathtaking mountain ranges, plains, and rolling hills. Our guides would tell us about the local history, the cattle ranches and potato farms, as well as all the wildlife: Sand Hill Cranes, Pronghorn Antelope, Whitetail and Mule Deer, Elk, foxes, and even a rattlesnake story. This gave us a great chance to get to know our Guides and, in many cases, learn more about a part of the country several of us had never visited. Our discussions on the way to and from the river also included a large amount of history about the Lewis and Clark expedition. The Beaverhead River, where several of us fished, was named by L ewis and Clark as was the Beaverhead mountain range that it flowed through. Was it mentioned that the food and accommodations were wonderful? Bison tenderloin, walleye fillets, salads, vegetables and desserts that were unique, delicious, and prepared perfectly. All served in a comfortable dining hall. We shared our meals with the other guests and met interesting folks from Los Angeles and Philadelphia. This trip had the potential to be a bust. Our hosts quickly “made lemonade out of lemons” so effectively it was hard to remember we had come hear to float the Smith. There will always be another day. On the last evening of the trip, we had several of our Guides join us for dinner. We laughed, joked, and enjoyed our last meal together. When our Guide got up to leave, several of us noticed he was choked up. That was all it took for several of us to get teary eyed ourselves from the memories that had been created, ones we could never forget. As I left the dining hall and headed to my room to pack for the flight home I looked out across the valley in front of me towards the mountains and got all the confirmation I needed. This was a trip of a lifetime.